This article explains how to generate multiple templates from a single form. You will learn step-by-step how to generate/send different documents to different recipients from only one Google Form submission. Simon wants to offer an event ticket to Delphine. The event manager submits a Google Form with details on the event (price, attendees, date, location etc.). Simon will receive the invoice and Delphine the invitation card. Create and personalize your current template. In our example, we selected our own Google Doc as template. info If you want to change your Google document, click the 'Edit' icon. Once you have configured everything click 'Next' again. On the 'Sharing Options & Notifications' screen, add the recipient who will receive the file every time someone submits the form. Then, click 'Done'. In our example, the generated Google Doc will be sent to delphine.leroy@revevol.eu. After completing the previous step, open the add-on menu again. Form Publisher will then duplicate the current Google Form into a new one (renamed ‘Connected to Event’), with the exact same questions. The connected form will be automatically linked to your current form. So every time someone submits the original form, data will be forwarded to the connected one. info Once you connected your form, if you want to add questions on any of the two forms, you will have to add it manually on the other one. Then, create and personalize your connected template with the markers you want, exactly as you did for your original Google Form. In our example, the generated Google Sheet will be sent to simon.debray@revevol.eu. Both document will be sent to different email addresses depending on your configuration. info Please note that each time you will want to duplicate your Google Form you will have to 'Add New Template' from your last duplicated form. warning For one single form submission by your respondent (on the original form), Form Publisher will generate as many documents as the number of templates you have set up. 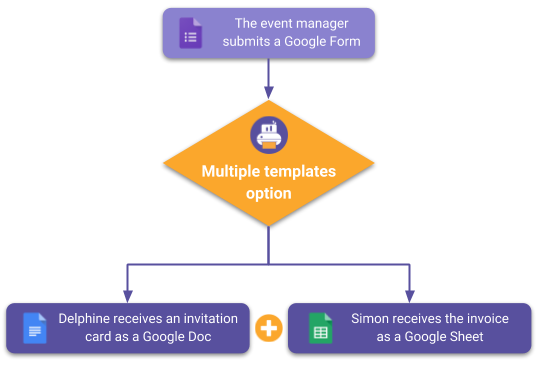 However, we recommend you to add 3 templates maximum (or connect 3 Google Forms) to the original Google Form. In that case it avoids any potential files generation conflicts with Form Publisher. Once you are done with all the configurations, open your original form. In our example, we go back to the 'Event' file. Every time your respondent submits a form (on the original one), Form Publisher will generate the files as Google Doc and Google Sheet.